The iTunes description for Heroes & Castles, a new third-person tower defense game that hit iOS yesterday, says it has "incredible console quality graphics." Really, they should've stuck with mobile-quality graphics. Maybe some nice 2-D sprites and backgrounds. Then maybe this game would be more fun to play. Don't get me wrong—Heroes & Castles is not a bad game. The gist of it is, you maneuver a hero around the battlefield, using him to kill ravaging monsters and protect your castle as you navigate menus to buy castle defenses and other troops. These sort of "tower defense but you're on the battleground" games have been done before, but this is a nice take on it, and I enjoyed unlocking new units and defenses. The game is tough, too: you have to pay attention and sweep carefully across your walls in order to keep them totally protected. 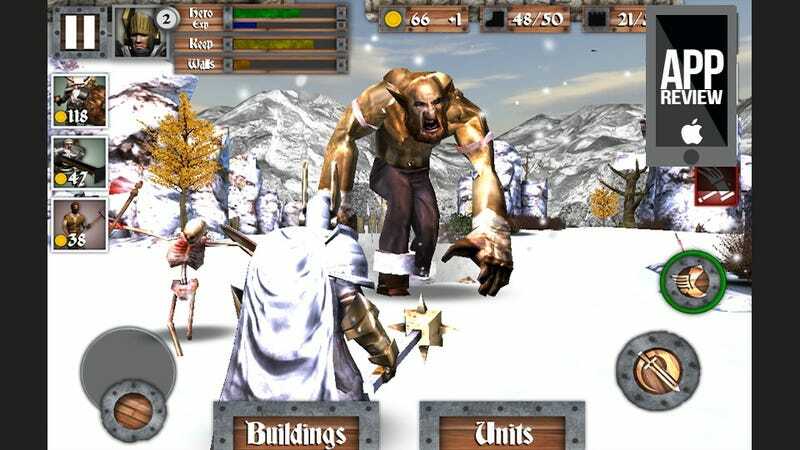 But in its attempt to be a graphical powerhouse, Heroes & Castles just winds up looking straight-up awful. It's clunky, janky, and all of those other words that end with "nky" (except funky). It's not pretty. Get used to that. Heroes & Castles isn't all that great to look at, even when it is fun to play, and as I play, I can't help but think it could've been so much better if the people behind it hadn't been so ambitious. I also suspect that I might have enjoyed Heroes & Castles more if it were on a device with buttons and joysticks, because playing the game on my iPad has been really tough. The controls are sometimes over-sensitive, sometimes under-sensitive, and have gotten me killed more than once because I couldn't maneuver my character in time, or my weapon didn't swing fast enough, or the camera went somewhere I didn't want it to go. Tower defense is a great genre, and I love seeing games that explore it in interesting new ways, but even on my phone or tablet, if I'm going to spend a lot of time with a game, it needs to be more polished than this.